SOUTH LAKE TAHOE, Calif. (VN) — Lauren Stephens has been a talented cyclist for several years. But two years ago, two things changed: Stephens got serious about bicycle racing and she had a plan. A former high school teacher in Texas, Stephens turned pro in the middle of the 2013 season. She exchanged math for a full-time racing career and success quickly followed. Stephens (TIBCO-SVB) will be among the favorites beginning Friday in the three-day women’s stage race at the Amgen Tour of California. Following Sunday’s circuit race in Sacramento, she’ll also be a top contender in the women’s individual time trial. 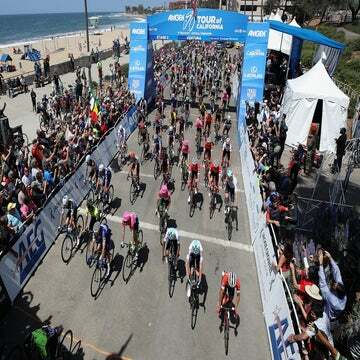 It will be held in conjunction with the stage 6 time trial in the men’s race in Big Bear Lake. Periodic rain and some snow flurries fell Thursday in the Lake Tahoe region with temperatures reaching only the mid-40s. Thundershowers are forecast for the 74-mile opening stage beginning and ending at Heavenly Mountain Resort. Stephens’ new commitment was also a family affair. She always been coached by her husband, Mat Stephens, an elite level rider for the Elevate team based in Ft. Worth, Texas. The couple met years ago in a Texas bike shop. Stephens is the reigning National Racing Calendar title-holder, and this season she is faring even better. After a half-dozen early-season race wins, Stephens claimed the time trial and overall title at the Joe Martin Stage Race in late April. Last week, she won the ITT and finished third in the GC at the Tour of the Gila. Women have raced at the Tour of California since 2008, but the 10th edition is the first time a stage race has been included. It’s part of an upswing in women’s events in the aftermath of a circuit race included last year for the first time in the Tour de France. Stephens appreciates women’s racing as much as any rider. But she’s outspoken in her take on the path to equality in the sport. “I see differently than a lot of female cyclists,” she said. “There aren’t as many women racing. There’s not as much depth. There’s not as much return for the sponsors. Piggy-backing off the men’s race is the best chance at success we are going to have.